You know that moment in your life when after numerous efforts of entering a raffle draw, that piece of paper with your name on it finally gets picked? Well, this was my moment. I had won a trip to tour with Adventure Tours Australia (ATA). I was given a certain amount of money and could pick any tours that would equal up to that amount. I’m not saying I wouldn’t have gone with them otherwise; it just made it easier that it came for free! ATA is a tour company that has been established since 1992. Their motto is “small groups, big adventures”, which I truly believe they live up to. 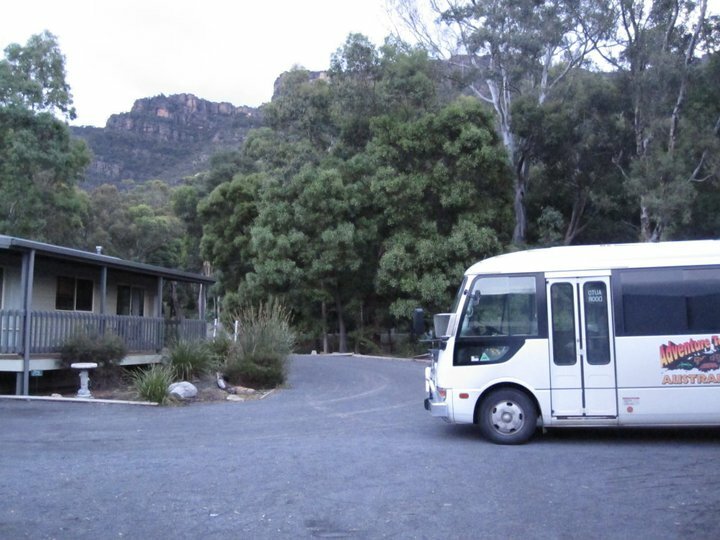 They have positioned themselves as the leading tour and transport operator in Australia offering packages that suit all budgets and tours that run throughout the country. They pride themselves with a reputation of excellence, innovation and reliability. There were two of us travelling. 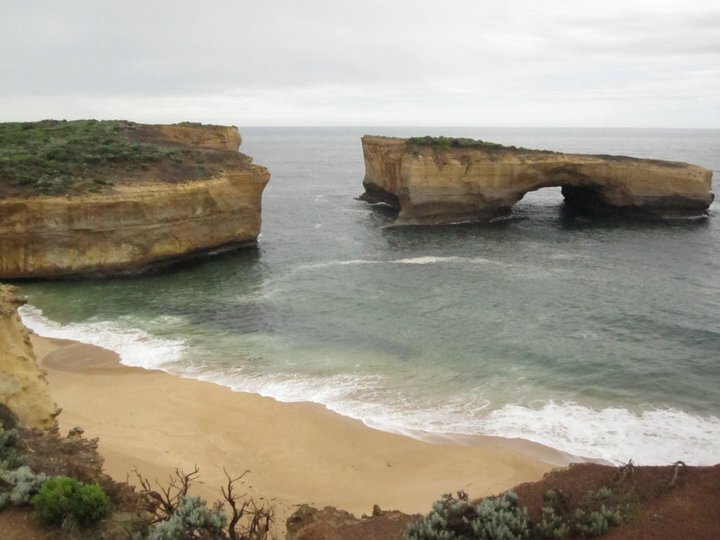 After much deliberation we finalized our travel plans to stick with two of their most popular tours on the East Coast: the 3 Day Grampians and Ocean Road Explorer, and the Cairns to Gold Coast Explorer. We had picked these two tours out as we had family in Melbourne and I didn’t want to miss an opportunity to visit the Whitsunday Islands. The next close picks were tours on the West coast between Perth and Darwin, so maybe next time. All in all, we were with this company for about 14 days total so I’ll try summarize my time with them. I’ll start with the tour guides and transport as these were the same for both, then I’ll break it down per tour. Also, random fact, we decided to go on this tour in the weeks leading up to Christmas. This was also the same month where the big floods in Queensland happened. Fortunately for us, we were ahead of the floods by a day. If we were held up for any reason, we were sure to have been a part of the nightly news of stranded locals and tourists. Following their motto of small groups, the average max number on any tour is roughly 15 - 20. Sometimes more if it is a larger or longer excursion. The buses they used on these specific trips are not the typical oversized coach but just a humble mini bus. They are slightly a bit older, but are air-conditioned (much needed for the tropical heat up north) and are comfortable. I’d say it’s cozy but I liked it that way, closer quarters meant it breaks the ice between fellow strangers and the rest of your time with them goes a whole lot smoother. I was very impressed with both our guides on the tours. The guides act as both the information holder and the driver. They are also the mechanic, chef and are stand up comedians. Both are born and bred Australians, are hilarious and were definitely one of the top things on my list of what makes this company great. This started and ended in Melbourne city. 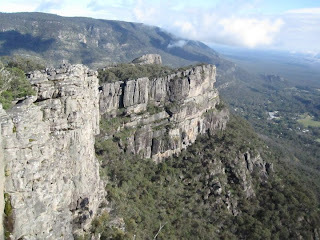 This took us up to one of the oldest mountain ranges – the Grampians, where we did a challenging but rewarding hike up to the peak or what they call ‘The Pinnacle’. If you’re game you can stand on the end of a large bolder jutting over the cliff edge, it has spectacular views of the surrounding forests and nearby towns. Definitely a breathtaking sight especially if you’re lucky enough to have a clear day. Our first night’s accommodation was at a lodge just down the road from the Aboriginal Cultural Museum, which we visited earlier in the day. As we had extra money to spare, we did end up upgrading to the double room option. Those with the upgrades stay at a different location usually just a walk away. We had dinner cooked at the back packers lodge- homemade spaghetti bolognaise and garlic bread. Juice and water are free and you just BYO alcohol. Being out in the bush, accommodation was reasonably clean and facilities were up to par. Walking back after dinner we came across wild kangaroos and joeys feeding as the sun set, and the night ended to us falling asleep to what sounded like a group of crazed monkeys yelling outside our window (which of course was just the sounds of cackling birds). The second and third day was our journey back to Melbourne via the infamous Great Ocean Road. At the same time was also when Ms Oprah Winfrey was visiting, or so we were told. We did see many helicopters flying above but I’d like to think she was in one of them. I understand now why this road is so popular. 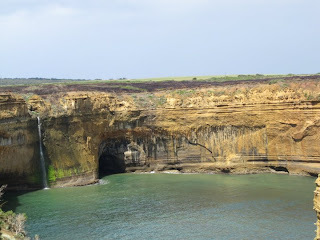 The rock formations, the ocean side, and the endless wilderness is definitely not to be missed. After checking into our next night’s accommodation we came back to watch the sunset over the sea and return just in time before a storm hit. Accommodation for this night was superb. We were put in a motel, lots of space and very clean while the others were in a newly built backpackers lodge about 5 minutes walk away. I wouldn’t have minded staying there actually, the owners were lovely, a good common area, there were many showers and toilets and a decent sized kitchen with everything you need. 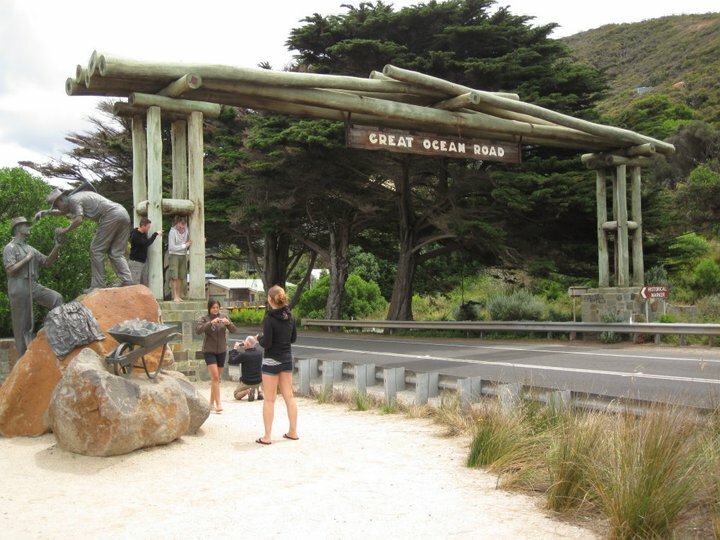 The last day was the trip back to Melbourne, with a few stops at notable landmarks along the Great Ocean Road. Lunch was served at a rest stop overlooking a local beach. This lunch wasn’t included in the itinerary but given to us out off the goodness of Bob, our guide. We came back into Melbourne city at about 5pm where we stayed for about 3 days before heading off to Cairns. This tour is actually part of a longer tour which finishes in Sydney. We decided to stop off at Gold Coast instead as flights to our next destination were cheaper from Brisbane. This cut the tour down to 12 days instead of 14 and meant we missed out on Byron Bay, where we could have learnt how to surf. We decided to fly in a day before the tour started to get a night’s rest before having to wake up early to get to the meeting point. We stayed at Gilligan’s Backpackers Hotel and Resort. This is one of the main backpackers in Cairns located on the main road. It has options for both hotel and dorm style rooms. Each floor had their own kitchen and common area, which I thought was pretty neat. The rooms were clean, well furnished and had air-conditioning. We managed to also score a free pick up at the airport as well, which is only a 10 minute drive away. There is a lagoon style pool, tourist information desk and a club attached on the ground floor. Everything a party-goer needs. 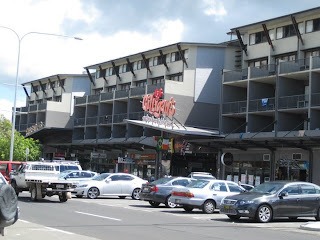 Cairns is a quaint little town, a very laid back feel to it. Known for its beach lagoon and a starting point to travel to the Great Barrier Reef, you will find many divers, snorkelers and party animals day and night. There is also a night market in the heart of their town which sells everything from food to souvenirs, bargaining allowed. 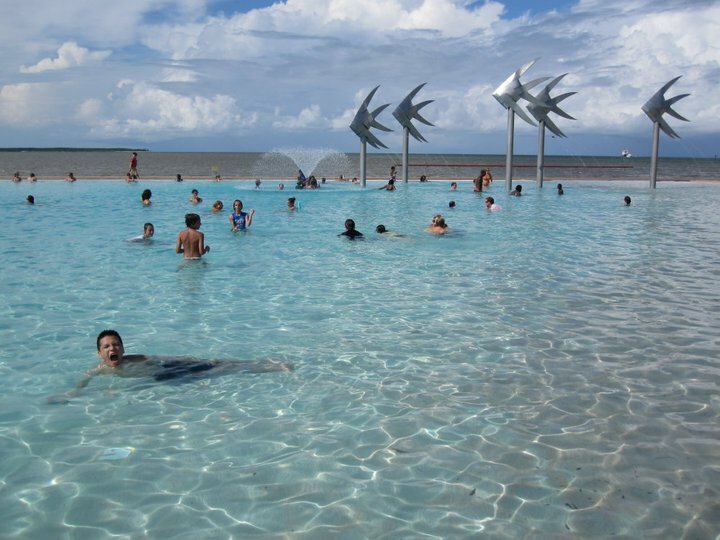 The beach lagoon is about a 10 minute walk from Gilligan’s and is a hot-spot for those who are not heading elsewhere to get their water fix. 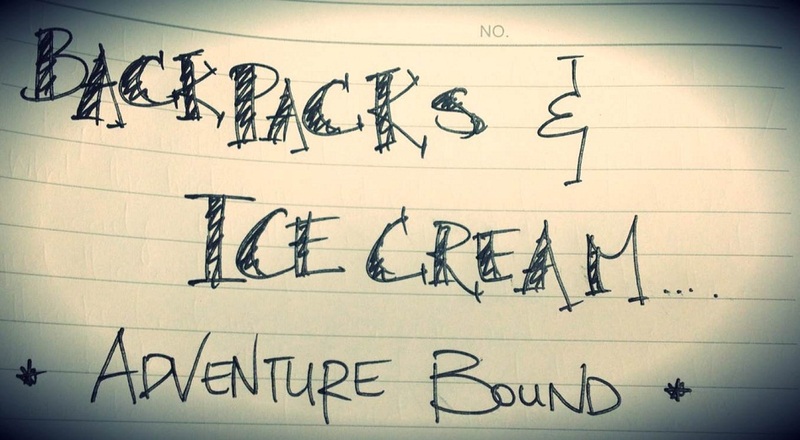 Back to the tour- this was a jam-packed itinerary. It was great though! Even though most days we were on the go, there was never a dull moment. We did, however, miss out one stop on the itinerary due to the flooding situation in Queensland. One tour group was already flooded in this gorge and couldn’t get out so as a group we opted into an extra night stay at the cattle station. I’ll highlight for you the best bits about this tour. Let me just start off with, Sam (aka Beaver), our tour guide. An awesome bloke with a lot of personality, charm and character. I must say, the best tour guide I’ve ever had and he will be hard to follow from here onwards! 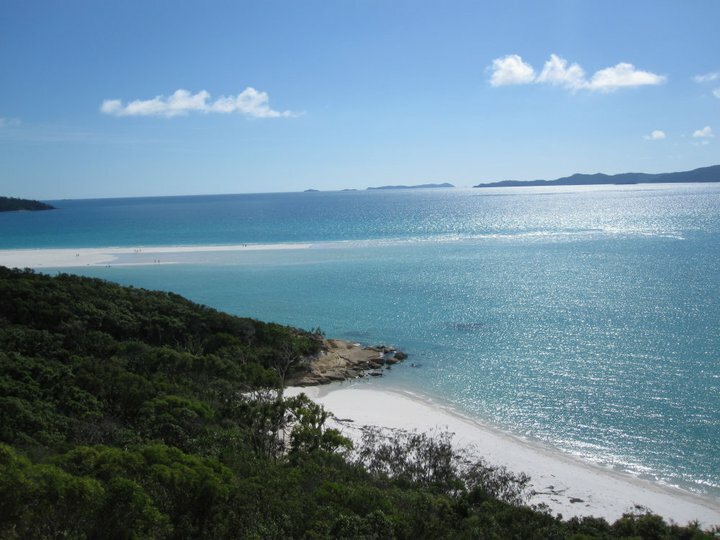 If you ever head towards northern Queensland, it is a MUST that you visit the Whitsundays. 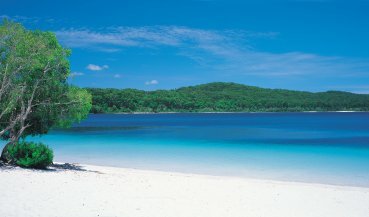 It is the gateway to the Great Barrier Reef, tropical reef and fish galore. The waters are warm and clear, the sand powdery white. 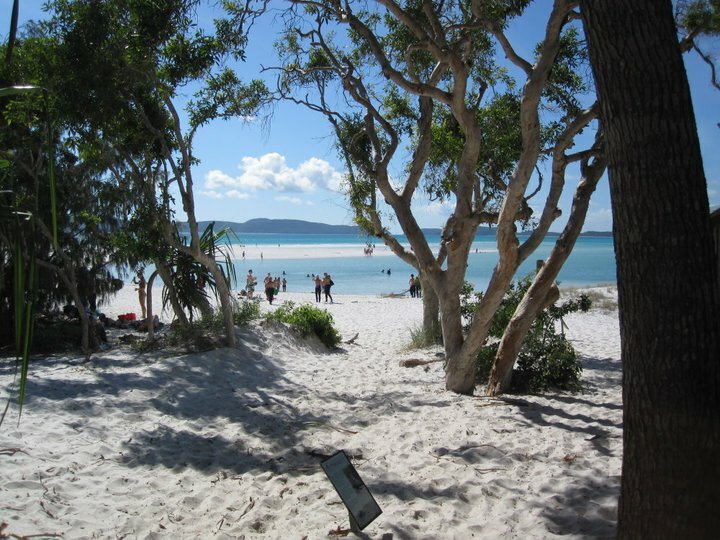 If you can, get onto a chartered boat or catamaran that will take you to Whitehaven Beach, THE most beautiful beach I have ever been to yet. The picture below says it all but it also doesn’t do it justice. While wading through the shallow waters, we could see baby sharks and stingrays swimming idly by. The sand is tiny grains of white heaven, so soft and so clean. Random fact: If you have ever seen the movie ‘Fool’s Gold’, this is where they filmed the scene where Kate Hudson throws out all their treasure onto that white sand strip. They say that the Whitsundays should have stolen the show, but my two or three nights here was definitely the best memory I have about this trip. A family run operation, they allow tour groups with ATA and their affiliates to stay at their 10,000 acre cattle station. The facilities are a bit more basic here but you do get to unwind, relax and get back to nature. 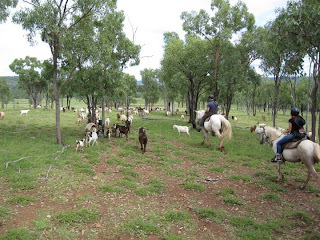 Here we tried our hand at riding horses, goat mustering, cracking whips and clay pigeon shooting. If you want, you can also go quad bike riding. We were welcomed with a slow roast of some kind of meat. We were told to just try it and he may or may not tell us after what it was. All we were told was it was some animal he had accidently ran over on the way to work! We all tried it anyway as it smelled delicious. Luckily, it also tasted as good as it smelled and went for second and third helpings. Anyhow, we managed to find out that it was just deer meat. Nothing too out of the ordinary. Also, every night you get the choice of steak or another meat for dinner, as you can see I can't remember what the other meat was as I never chose it. Having fresh steak from a cattle station is the best kind of meat you can have! Food served here is home grown, homemade and mouth-watering. For the second to last night, we got taken out to a local campsite where we shared tales around a bonfire and slept under the stars. 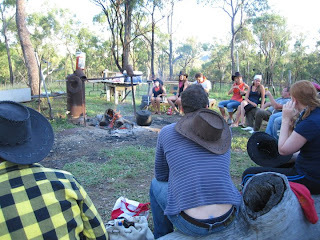 Here we were given a taste of the local bushman's recipe of damper and baked beans cooked out of a hot can over a lit fire. The toilet situation is a little nicer than what you might be thinking. No, it wasn't a dig your own hole situation. There was one toilet out there in a homemade corrugated iron tent, but you still had to fill up a bucket of water if you did need to flush. This is where the rule of “if it’s yellow let it mellow, if it’s brown flush it down” is enforced. We ended up having our Christmas Eve here at this big resort style accommodation on the island. We were taken over to the island on a bus on a ferry! It’s still quite a rugged place, no roads or ‘downtown’ areas. Dingoes roam freely and the highway is the strip of sand on the beach which is how the buses get into and out of the accommodation. This island is listed as a UNESCO World Heritage Site due to its flora and fauna. We were taken to the end of the seventy-five mile beach where we could hike to the peak, overlook the edge and if the water isn't churning you can see sharks feeding in the waters below. This is also home to the beautiful Lake Mackenzie, a fresh water lake, and Lake Wabby. We were then taken back to Rainbow beach where we ended our last night have a big Christmas spread put on by the hostel and Beaver. Drinks, laughter and some goodbyes were said before we were taken to Gold Coast the next day. Definitely an eventful trip. I noticed this tour is very popular in the UK so most of the tourists came from England and Ireland, one American. On the whole, a great tour, great people and great memories. 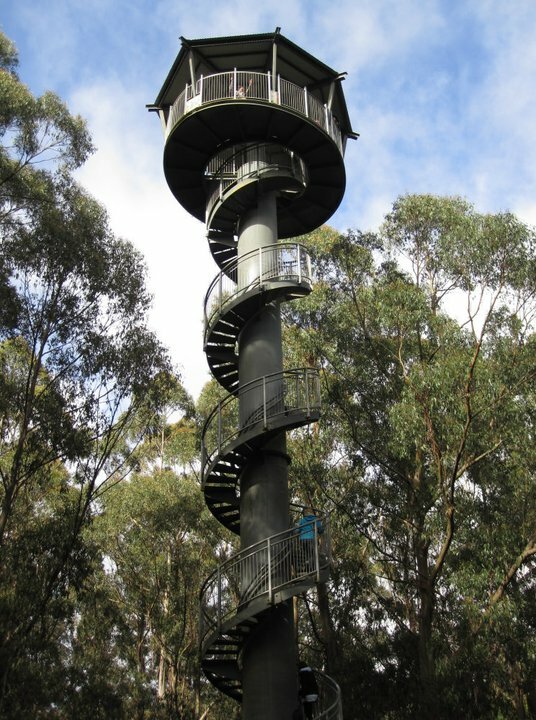 It sound that you had wonderful time there and enjoyed you adventurous trip. I had never won trip like that in my life but always headed trip my own you are really lucky one have experience like this . I really enjoyed reading this post. Keep sharing more of your experience like this. Hi Ella. Thanks for your comment! It was definitely an enjoyable trip, one I wish I was still on! 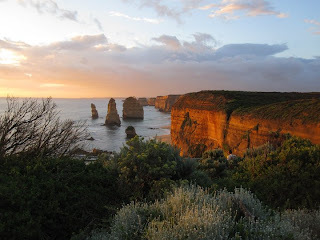 You never know, one day you might be able to win a trip like this =) Thanks for reading my blog.